Since a lot of people tend to make a lot of generalising from only my Food Fridays, I decided to make a small summary of what I ate the entire week. This should give you a better overview of what my LCHF diet looks like. Ofcourse it varies a lot each week but calories and macros are in the same range all the time. It also shows that sometimes I eat more (look at Thursday), sometimes I overeat some things etc. I’m not perfect and that’s OK. I hope I didn’t forget to mark anything down. I normally don’t eat dark chocolate but this week I just felt like eating some so I did. 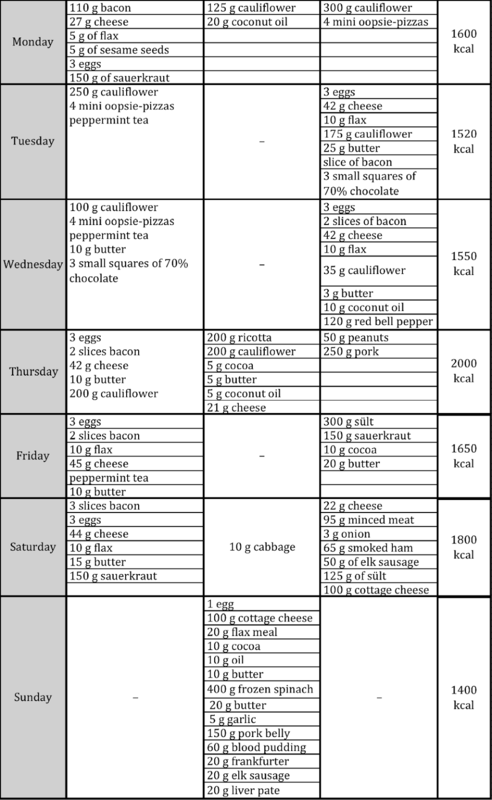 The average caloric intake came to 1650 kcal per day. As always, I ate eggs in some form every single day. NB! There is all of the food and drinks I ate/drank marked down in this table, except for the 2–3 litres of water I drink every single day. I won’t be making this type of posts any time soon again because I don’t think many people will be interested in exploring those large tables. But one is good as an overview of what my LCHF looks like.